Whilst Sony have been busy releasing mirrorless cameras, such as the full-frame Alpha 7 series or Alpha a and NEX options, it’s been over a year since they launched a traditional DSLR style camera. 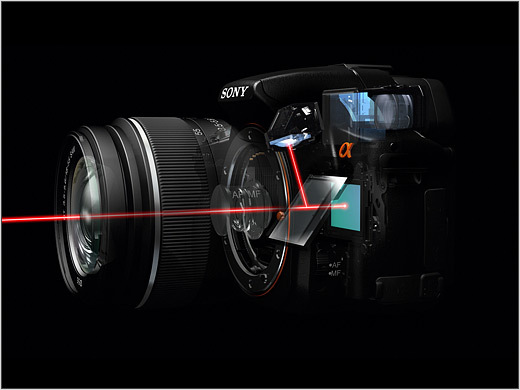 That’s now changed with the launch of a new flagship APS-C camera, the Sony a77 II, featuring Sony’s Translucent Mirror Technology. Commonly referred to as a Single Lens Translucent, or SLT camera, this innovative Sony development offers a fixed mirror, which splits the light between the imaging sensor and phase-detection autofocus sensor. The advantage of SLT is it enables phase-detection autofocus during stills & video capture, a constant Live View feed to the EVF / LCD, as well as faster frame rates for continuous shooting. 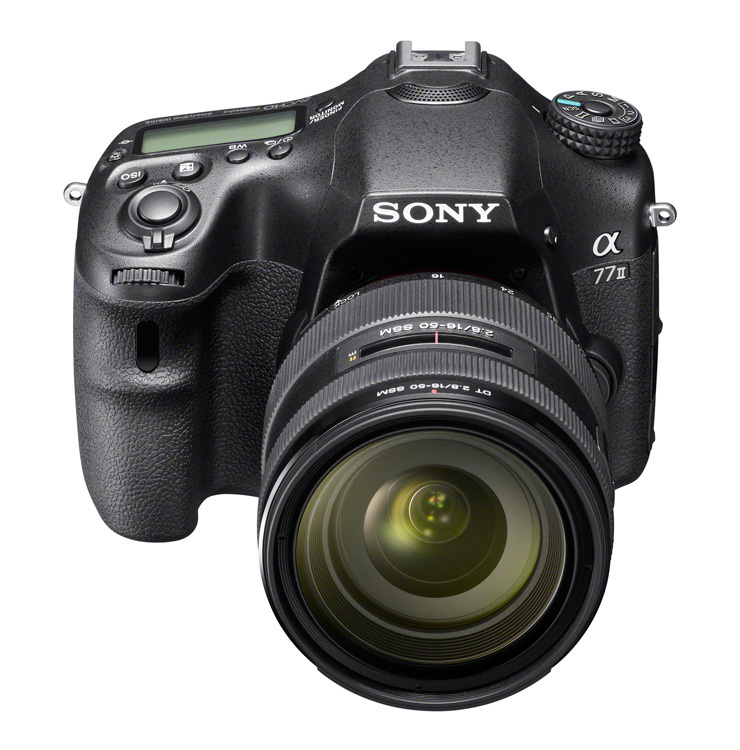 Released back in 2011 the original Sony a77 certainly pushed the boundaries for APS-C cameras, thanks to its high-resolution APS-C sensor, fast frame rates and advanced autofocus system. Three years is a very long time in digital camera development however, so what’s new on the Sony a77 II? Well, there’s a new autofocus system, featuring a whooping 79 phase-detect AF targets, an extended ISO sensitivity range, between ISO100-25,600 and Sony’s latest BIONZ X image processor. For continuous shooting the frame rate remains at 12fps – although that’s still faster than many pro DSLRs, and the new Sony a77 II can capture 60 full-resolution jpegs, compared to just 12 for its predecessor. Featuring a 24.3Mp Exmoor CMOS APS-C sensor, the resolution on offer is the same as on its predecessor the a77, but with greater sensitivity up to a maximum ISO of 25,600, compared to ISO 16,000. On paper it looks to be the same sensor from the new Sony a6000 mirrorless camera, released back in February, which achieved an overall DxOMark Sensor Score of 82. That ranked the Sony a6000 24th for all sensors on our database, and a very respectable 6th for all APS-C sensors, only 2-points behind the class leading Nikon D5200 with 84. So the signs are relatively encouraging, although sensor scores from the Sony a6000 haven’t progressed significantly from the original Sony a77. 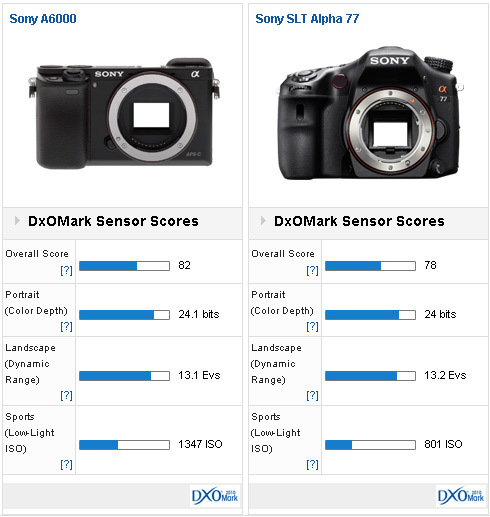 Achieving a DxOMark Sensor Score of 78, the Sony a77 ranked 51st for all sensors and 8th for APS-C cameras. In fact with Color Depth and Dynamic Range results between the Sony a6000 and Sony a77 almost identical, it’s only the improved ISO sensitivity on the Sony a6000 that gives it the edge over the a77. 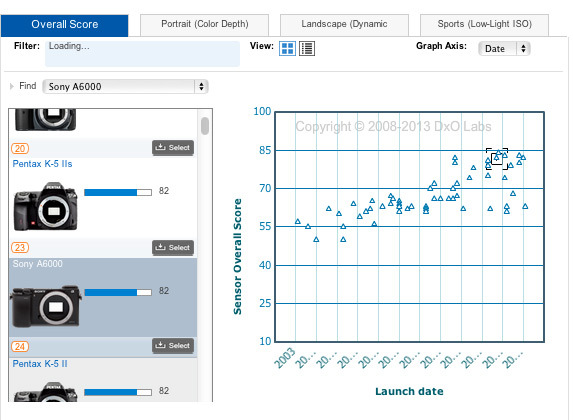 You can read our test results and sensor scores for the Sony a77 here and Sony a6000 here. We’ll be testing the new Sony a77 II soon, to confirm these results, but if they do remain consistent with the Sony a6000 then Sony’s new flagship APS-C SLT camera will certainly be holding it’s own against the APS-C DSLR competition. 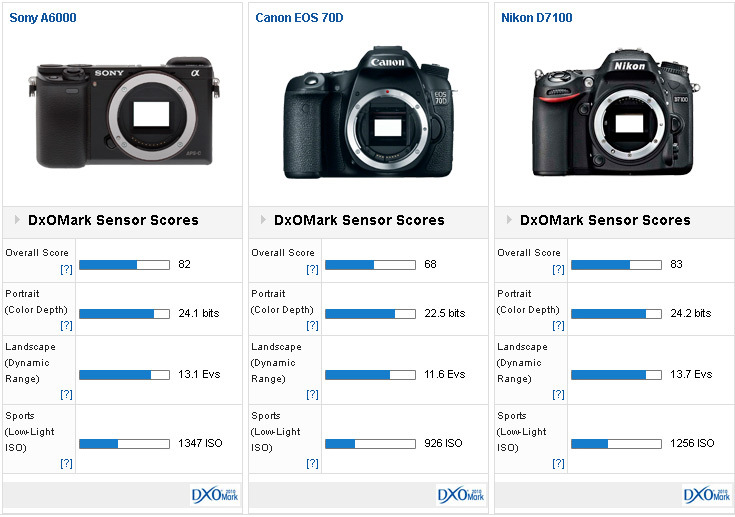 Head to head against the Nikon D7100 and Canon 70D the Sony a6000 offers comparable results to the Nikon D7100, with an Overall Score of 82 vs 83, and out trumps the Canon 70D in all categories. If you’re a serious wildlife or sports photography enthusiast, but can’t afford the jump to full-frame professional DSLRs, then the improved performance and new autofocus capabilities on the new Sony a77 II should appeal. 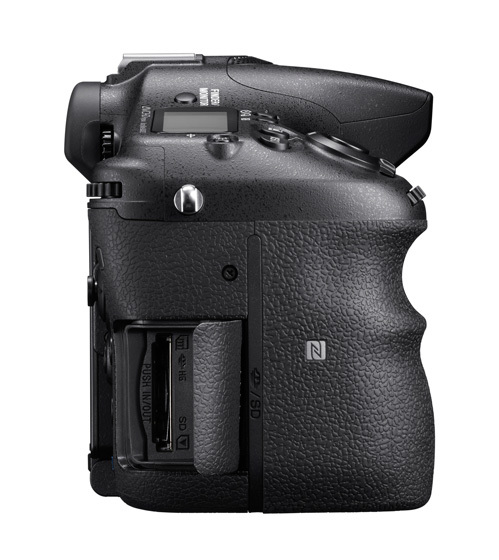 With a whooping 79 phase-detection autofocus targets the Sony a77 II offers more AF targets than both Nikon and Canon flagship professional DSLRs, which have 51 and 61 targets respectively. On the Sony a77 II 15 of the 79 targets are the more accurate cross-type variety, for quicker and more accurate autofocus, and there’s a dedicated f/2.8 AF target in the centre, for maximum precision using larger-aperture lenses and improving accuracy in low-light. Subject tracking autofocus has also been improved with the addition of a new Expandable Flexible Spot mode, which, Sony says, helps the camera maintain focus even if the selected AF target loses track. If it works, that’ll be a great advantage to snappers needing accurate focus on action shots, and there’s also a new Eye AF function mode that detects and focuses on a subject’s eyes, which will be of interest to portrait photographers. Other features include a 2.4m-dot XGA OLED ‘Tru-finder’ (Sony speak for an EVF), so there’s no optical viewfinder, as the Translucent Mirror doesn’t provide enough light for one to be practical. 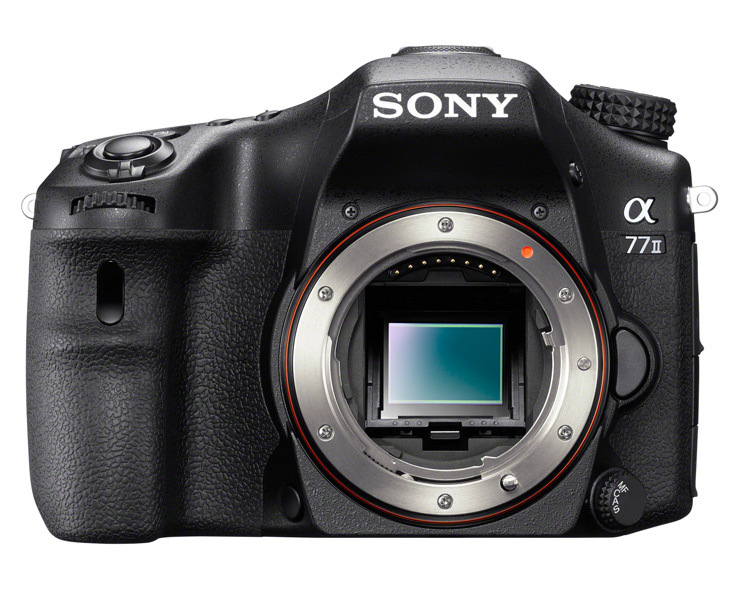 The Sony a77 II’s magnesium camera body is also weather-proof, featuring dust and moisture seals around the buttons and there’s double-layer protection around openings, such as the SD card slot. 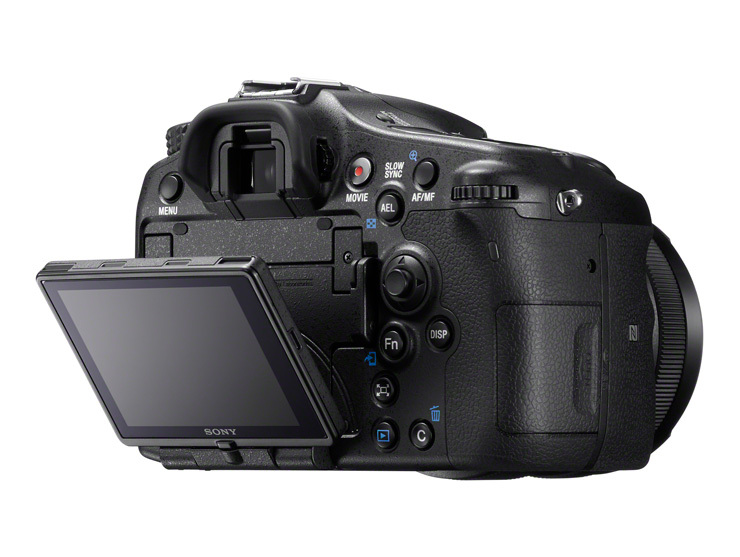 There’s also a 3.0” tilt-angle LCD screen with Live View, Full HD video capture at 60p and 24p in AVCHD 2.0 format, 1200-zone metering, and the new Sony a77 II can take Sony Memory Stick media, as well as SD, SDHC and SDXC (UHS-I compliant) memory cards. The Sony a77 II is compatible with all 32 Sony a mount lenses, as well as older Minolta/Konica lenses, and will be available from summer 2014, with pricing still to be confirmed.